The City Paper’s “Best of DC” poll ends tomorrow. Have you voted for your favorite local blog yet? Click here to vote for the Natural Capital! 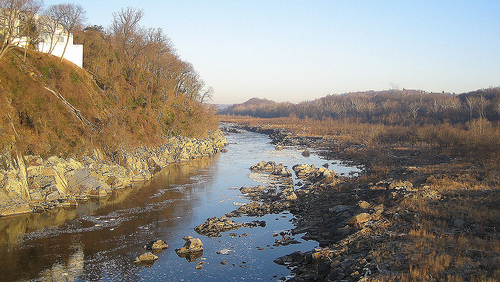 The Potomac Heritage Trail is a relatively new resource to the DC area that deserves a full Natural Capital write-up sometime in the near future. In the meantime, there are two hikes on the trail this Sunday (3/21). They get bonus points for starting from Roosevelt Island, which is accessible from the Rosslyn Metro (see our directions here). Roosevelt Island to the Chain Bridge & Back – A 9 mile route with folks from the Sierra Club following the Potomac Heritage Trail out, and the C&O Towpath back, stopping for lunch at Clyde’s in Georgetown and then back to Roosevelt Island. Potomac Heritage Trail – Also on Sunday, also leaving from Roosevelt Island, but with the Center Hiking Club, and about 45 minutes after the Sierra Club folks. This will be an 11-12 mile hike stopping for lunch at one of DC’s Civil War forts. See our full calendar for full details and RSVP info, or for the many, many great sounding trips and classes this week. And don’t forget about the Environmental Film Festival! 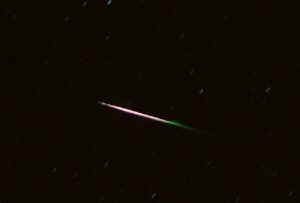 Like the photo in this post? Mouse over for credits; a click takes you to the photographer on Flickr. 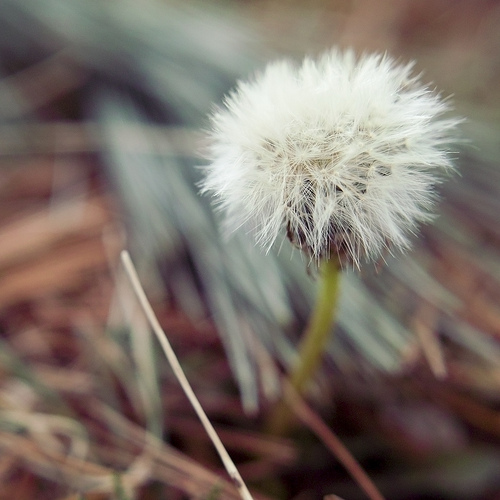 Spring beauties are not a showy flower, but we find their little blooms dainty and adorable. 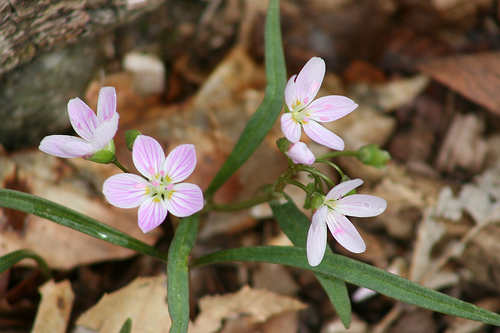 They’re one of the first to bloom among the flowers called spring ephemerals: perennial flowers that emerge every spring on the forest floor, before the trees leaf out, then fade into the background (or die back entirely to the ground) until next spring. They’re also one of the longer-lasting blooms, so you’ve got a wider window of opportunity to find them. By mid-March, the spring beauties are blooming. 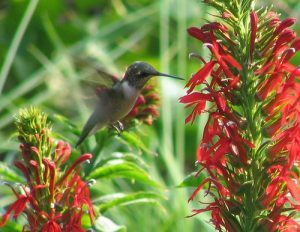 The flowers are small (maybe 3/4″ wide) and low to the ground — the entire plant usually doesn’t grow any taller than 4 to 6 inches. At any other time of year, they’d be easy to overlook. In early spring, though, they’re a major part of the show before other things start blooming. 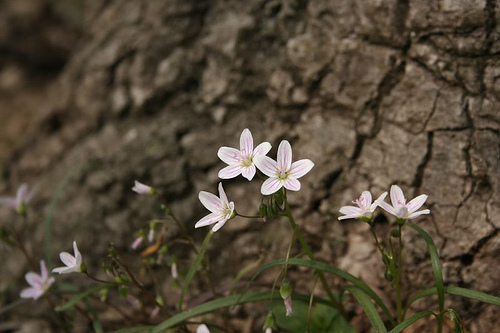 The flowers have 5 petals that can be white or light pink. If you look closely, you’ll see they’re candy-striped with thin pink lines pointing to the center of the flower. And just in case that doesn’t tip off the pollinators well enough, the center opening of the flower is highlighted with little yellow spots. Watch for how the flowers react to the weather. On a sunny day, they’ll open wide. But with clouds, the petals fold back up and wait for better weather. It’s another thing we love about these plants. 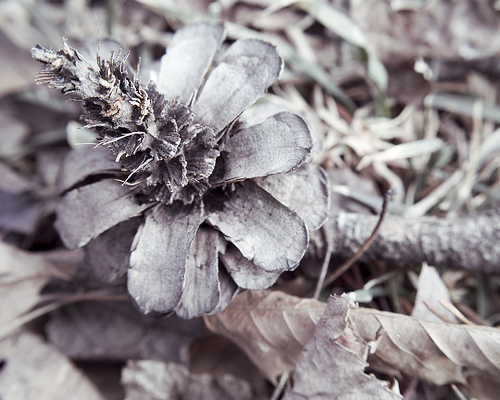 By early summer, the flowers and leaves of spring beauty will shrivel up and die back to the ground. But several inches below the ground, the plant is storing energy for next spring in a little corm that can be as much as 6 inches underground. We’ve heard these tubers called fairy spuds — they’re starchy and edible when cooked, but each one is tiny. It would take an awful lot of energy to dig up enough fairy spuds to make any kind of meal. But apparently Native Americans and early colonists found them excellent. We’ve tried a few fairy spuds from our yard — but I think I prefer to see the flowers. 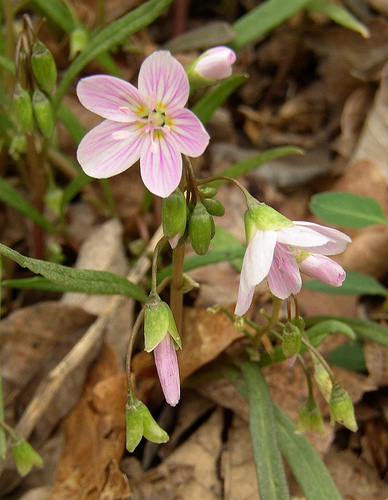 In the woods: Spring beauties can be prolific where they’re not overgrazed by deer. We’ve come across areas that are carpeted with them. They’ll bloom first on slopes that face south. In your yard: We love the spring beauties we’ve planted in a shady spot in our backyard. 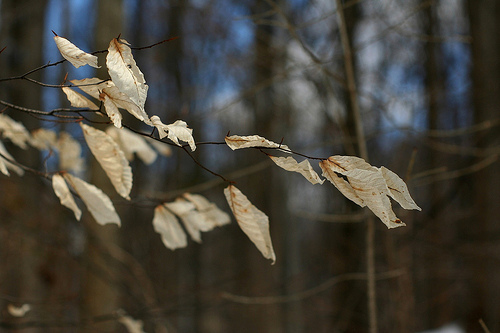 They’re a great reminder to get out into the woods and see what else is coming up. Do you like our LOOK FOR posts? 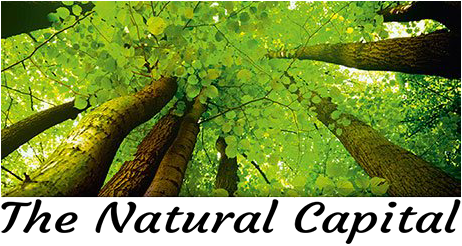 Want to let others know about the Natural Capital? Vote for us in the City Paper’s “Best of DC” poll! Spring is coming, I promise. But this week folks were still posting pictures of late winter. 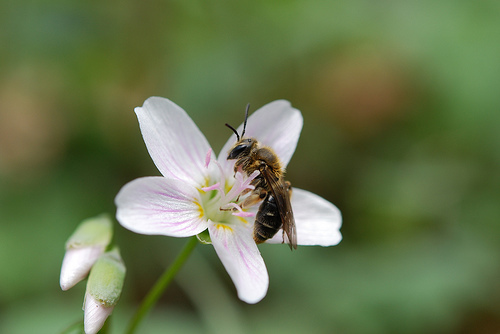 Do you like the photography at the Natural Capital? Want to let other folks know about us? Click here to vote for the Natural Capital in the City Paper’s “Best of DC” poll!